I really enjoy cooking Chinese dishes. If you are into this too then you know that having a good wok is essential. A traditional wok has a round bottom so it’s very difficult to use it on a stove top. Further more it must be made of materials that heat up quickly and are able to maintain high teperatures for stir-frying. Stir-frying is the traditional Chinese cooking techniques in which the food is tossed in the pot with quick movements, so the vegetables stay crispy and juicy and the meat is nicely cooked or seared. A year ago or so I decided to buy a new wok and I decided to go with an electric wok. You might say that this is not true to the basic concepts of Chinese cooking but I thought it would have been more practical. So, I decided to go with the Breville electric Gourmet wok. I must say that I’m vry satisfied with its performances. It’s very sturdy and well engineered. The bad thing is that is quite heavy, it weights 12 pounds, so you will not be able to lift it and toss the food around. How well does it perform in regards to stir-frying? Surprisingly well. It generates enough heat for this cooking technique just like a stove top wok. This electric wok can get really hot especially when you put it on the maximum “high sear” setting. Furthermore it responds very quickly to temperature changes. There are 15 different heat levels to choose from! This wok is wonderful for steaming as well. 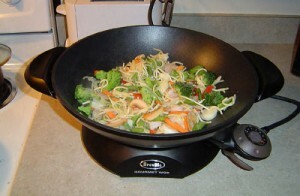 The wok has a glass lid with a convenient steam vent. When you are finished steaming you can open the vent and let the steam out. This is great because you can keep the food under the lid warm but without further steaming. The wok’s surface is non-sticky so you really need small amounts of oil for cooking. Just make sure you use the spatula gently so you don’t scratch the surface. You can use the spatula that comes with the Breville wok but I would advise you to get another one. The wok is dishwasher safe. You must detach the wok from the base, which can be tricky in the beginning. I prefer to wash by hand though, because this will make it last longer. Overall, I have to say this wok is one of my favorite tools in the kitchen. I use it for all sorts of dishes and cooking techniques. You can use it for deep frying, steaming, boiling, stewing, etc. and not just for Chinese cooking. This entry was posted in reviews and tagged breville gourmet wok, electric wok. Bookmark the permalink.